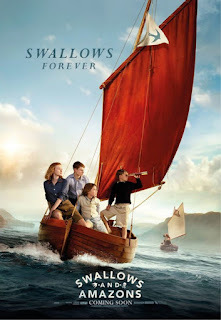 The story of ‘Swallows and Amazons’ occupies a small place in my heart. To be perfectly honest, it occupies several small places in my heart. So, this afternoon, I set off, all by myself, to see the brand new film that’s just been released in cinemas. I’m glad to report that those places in my heart are safe and sound and, if anything, have been made just a little bit bigger. This might be a better story if I could trace my relationship to the book all the way back to my own childhood but I can’t. I read a lot of things but I didn’t read that. The book actually came to me as an adult but there were some kids involved and those kids were my own. Every night, I used to read a little bit of a book to my kids when they were tucked up in bed. In this tiny ‘bit-by-bit’ fashion, huge swathes of literature was read aloud and sleepily consumed. Things like ‘Watership Down’, ‘The Hobbit’, the entire ‘Lord of the Rings’ trilogy, all of the Harry Potter books (except the last one… the reading was finished by then) volumes and volumes of reading in tiny bits, every evening, over years and years. And one of these books was ‘Swallows and Amazons’ by Arthur Ransome. It was part of a children’s’ treasury collection that I got from somewhere. Little hardback books like ‘Treasure Island’ and such. I thought it might be a nice read and so we launched into it. I think my son liked it, how could he not? But it was me who fell hardest for it. Here, you see, give or take a few elements, was my own childhood transcribed into a book. The lake, the boats, the island, the camp fire, the fish, the adventure. The little story transposed itself effortlessly into the vivid geography of my own memories and validated the adventures of my youth. If that doesn’t warrant a small place in my heart, then I don’t know what does. Fast forward then to an entirely separate thing. A friend tentatively made on Twitter. We frequently hesitate to use that word 'friend' when it comes to social media interactions. It can be fraught with misinterpretation and one sided expectations between people who will, most likely, never meet in person. But, sod it, here was a friendship made. At first, a simple exchange about a favourite musical. Later a beautifully written radio play listened to while decorating the kitchen. I know it sounds tenuous and hard to conceive but friendships can be forged with little things such as these at their root. Add in a tight network of mutual online acquaintances – people of the highest quality - and suddenly one cares how things go with people. How things work out. When I heard that Andrea Gibb was commissioned to write the screenplay for Swallows and Amazons, it was, for me, a moment of great serendipity. A valued pal and a treasured story, thrown together. It was exciting and it was nervy too. It became important that it would all work out. It has all worked out rather beautifully. Speaking as such a fan of the source material, the brand new film which Andrea Gibb has written and which Philippa Lowthorpe had directed is a lovely thing. There are additional story elements here, necessary to enable the transfer from page to screen in a completely engaging way, and these work admirably well. But it is the very 'outdoors'ey, adventuring nature of the book that weaves the main magic here. Is that just me? Because I have been out in that breeze and skidded across those grey-blue waves? I don’t think so. I think we all crave a little real adventure. And that’s the thing with Swallows and Amazons, it is a real accessible adventure. You don’t need to be able to fly or leap tall buildings in a single bound to have an adventure. All you really need is a back garden, some conspirators, and a will to venture out. That’s why the kids at this afternoon’s show remained enraptured. The parents might have been nervous on their behalf, for where was the million pixel animation and where was the primary-coloured super hero? These heroes point their bow to the centre of the deep lake and, before they are done, will hold real fire in their hands. These are adventures that can be carried out from the cinema and into the real world. Children can see all that. Children know. In my own childhood adventures, I was definitely Roger. My elder brothers kept the knives, real and metaphorical, for themselves and always stood a little in defence between me and the world. You could see it clearly in young Bobby McCulloch’s eyes, on screen. The burning need for acknowledgement, to be a bona fide big boy. I was Roger and he was me but each of the Walker children will find a soul mate in each darkened theatre where the film plays. Tatty is so wonderful, literate and feisty and the elder children carry the pressures and responsibilities that come with their station. Knowing a little of the screenwriter, it is interesting to see a taste of that strong social and moral sense seep neatly into the writing. Even the villains, for all their cocked hats and ironic smiles, even they have their own code, their own subtle doubts about what they do, their own respect for genuine strength and bravery. It is, at the end of the day, a story for children and there must be an element of gentle threat and conspiracy and ultimately a general ‘winning of the day’. But lots of adults, like myself, will come to the picture house alone with their furtive popcorn and they, too, will find what they seek. A sense of the outdoor childhood that we all remember a little better than it actually was. A time of freedom and adventure. A sense of home. So these are the small places in my heart. A children’s book which moved me as an adult and a friend entrusted with the responsibility of keeping it safe in its transition to the screen and doing an absolutely wondrous job. It’s all worked out well. It’s all worked out great. Just in case you think I'm making all this up, here's a thing I wrote some years ago about our 'own' island. I should clarify the comment I made on ‘On Beezie's Island’. When I wrote, “I did go through my Swallows and Amazons phase” I was talking about the adventuring. I’ve never actually read the book. I’ve never read any of The Famous Five novels either and I was brought up on a steady diet of Enid Blyton; I was a fan of The Secret Seven however who tend to get forgotten about as do The Adventurous Four. I do get where you’re coming from and there’s nothing worse than seeing a beloved text hacked to pieces or “re-imagined” by a screenwriter and director who want to put their own stamp on things. I look at the upcoming list of comic book adaptations and whereas once I would’ve drooled at the prospect of most of them now I find myself filled with dread because even when they get it right they somehow manage to muck it up: case in point, Watchmen. I watch them all even after I’ve read how bad they are because there’re so few of them and as long as I don’t expect much to start off with I’m usually not terribly disappointed. I’m just waiting on a film version of Catcher in the Rye to be honest which I will probably hate. Have you read all 12 books? I read the first book on my first solo camping trip, age 16. My favourite is probably Winter Holiday.